It's Summer now, but I'm glad those bright stripes stuck around. Today, I wanted to share a new favorite with you. This sherbert stripe top has a super flattering front tie and back button detail. I've been wearing this casual with these rose gold birk dupes, but it would also look great with any blush heel, too. Also, since I purchased this shirt last week, I this style came out in a front button-down version, which I also love. Jeans are my go-tos. Super stretchy and super distressed. They look amazing with sky high heels and equally as good with a pair of sandals. Enjoy the rest of your week! How cute! 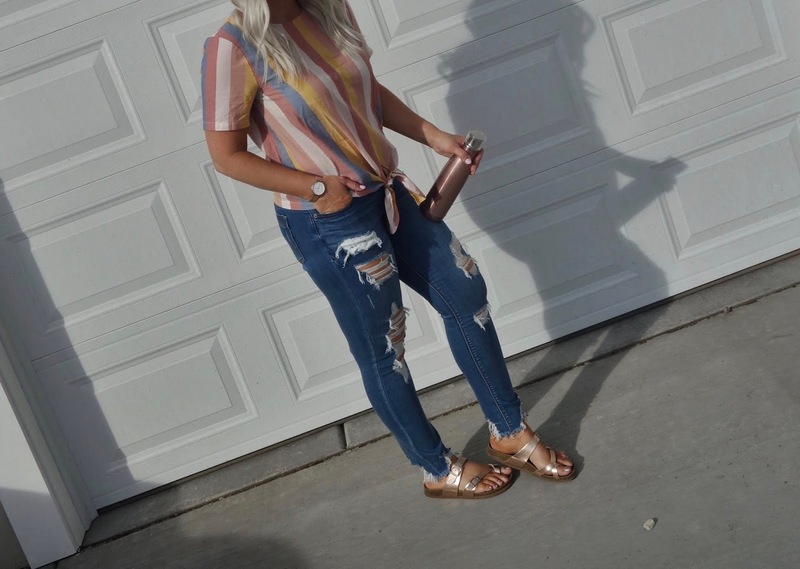 I love your ripped jeans and the colors in that top are gorgeous. Love the stripes! 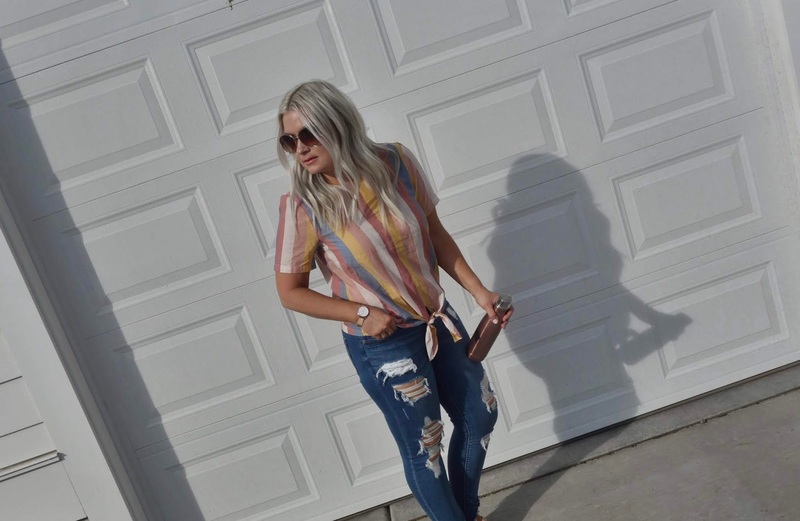 And distressed denim is always so fun for summer! Me too. Took me forever to find the right pair. I love the stripes and fun colors! A perfect piece for the summer! What a great look...super chic! Really cute top. I like the flattering look. Thank you. And I agree, super flattering. Really love this look! It looks great on you and the colors are so vibrant. I'll be sure to check it out! I love how the colourful stripes contrasting against the white garage door! I think stripes are really slimming, and colourful stripes is always a bonus! Slimming? Can't go wrong with that :) Thanks! Excellent combination. The photoshoot locations have enhanced the pictures. Yes, I love the combo. Thanks! I just read another blog post that featured these pieces from Madewell!!! 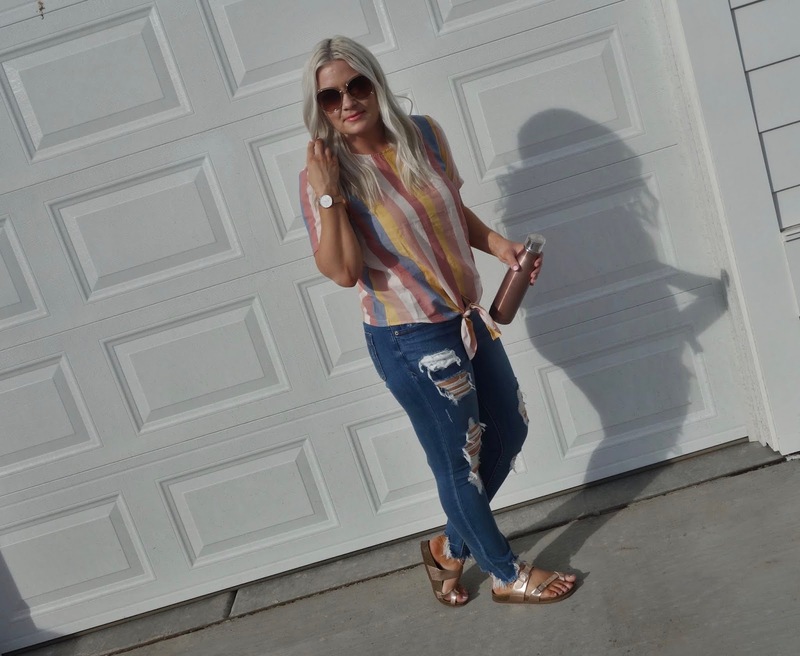 This must be a sign because I loved these piece when I saw them on her blog and I love the way your styled your top too!!! I’m definitely gonna check out Madewell’s website! One of my favorite stores for sure. Everyday stuff that you can dress up or down.